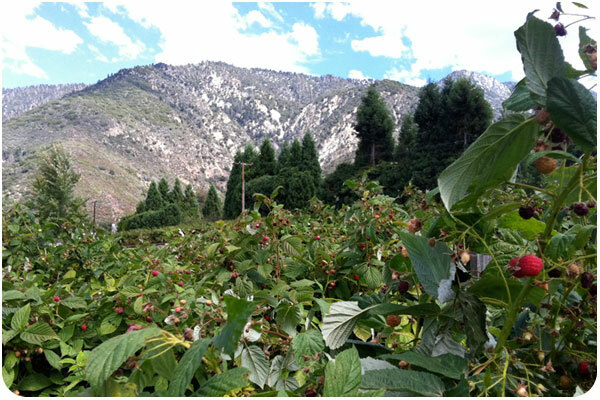 last week, my friend seth and i took a day trip to oak glen above yucaipa for some apple & raspberry picking. i highly recommend this area for some good-time harvest season fun [but fair warning: the whole area is packed on weekends]. we were hoping to avoid the weekend crowds, but alas, there is no self-picking on weekdays save for raspberry picking at snow-line orchards. i had been looking forward to berry picking anyway, so we split a mini-pack of fresh cider donuts, bought our cartons [12 bucks will get you an empty 3-pack to fill yourself] and got to work. there’s a lot more than raspberries going on in the raspberry patch though. 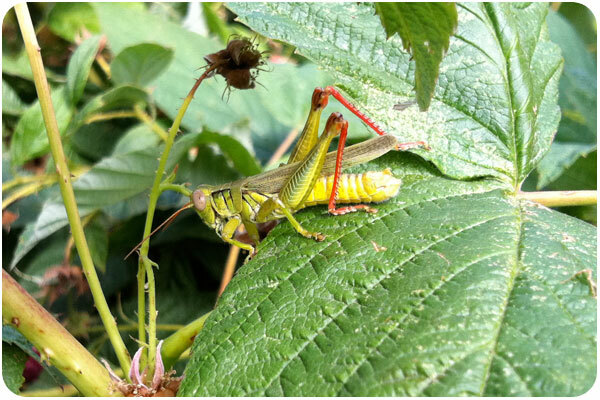 it’s an entire microcosm of activity with grasshoppers jumping around, bright green leaf beetles going about their business, little brown frogs croaking from somewhere in the bramble, and not least of all, BEES! they’re everywhere! i thought they might be pollinating flowers, but upon inspection it seems that bees are little vampires when it comes to raspberries, gently puncturing each individual drupelet and drinking the juice. if you’re allergic to bee stings, you might want to steer clear of raspberry picking, but seth and i never got stung. the good old rule of don’t bother them & they won’t bother you still stands. it took us about an hour to make our way through a few of the rows and fill our flats. picking raspberries is a pretty simple technique of searching out those of the deepest color, gently pinching the berry and pulling it away from the stem. if it doesn’t come off easily, chances are it’s not ripe. 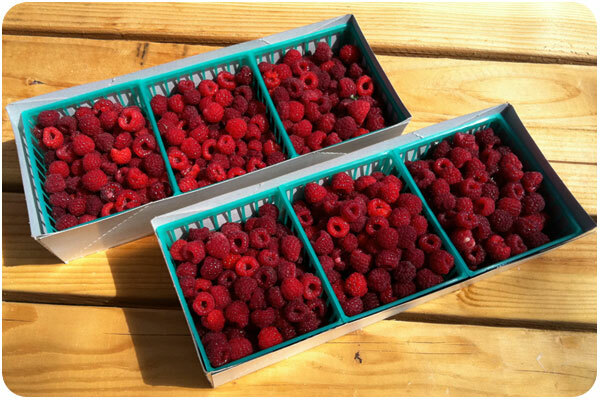 unlike stone fruits, raspberries do not continue to ripen once picked, so it’s best to only pick the ripest fruit. you can save time by searching out clusters of ripe fruit, cupping your hand and picking several berries one after the other, letting them drop into your palm as you go, rather than placing each one individually into your basket. despite all the delicious-sounding baked goods i found starring raspberries, i have opted to eat most of them fresh, to get the most of the raw nutrients. i made up this raspberry parfait that uses more fruit than i’d ever normally use if i’d bought them locally [this recipe would easily use a whole small carton]. what a luxury to have this much fruit! 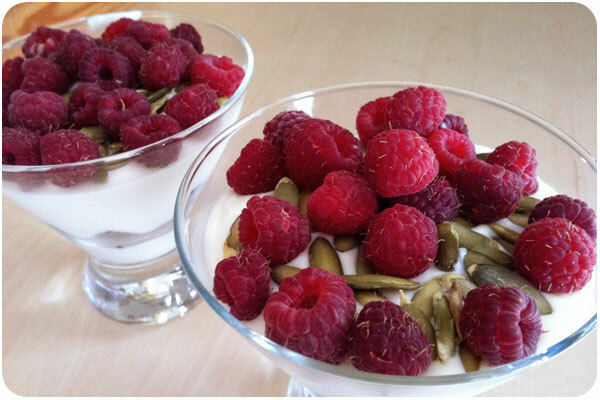 place everything except the raspberries & pepitas in a small mixing bowl and mix until you reach a uniform consistency. taste and adjust flavors if necessary. depending on the glass you use, you can choose how to layer your berries and yogurt. i chose these martini glasses, so i put a heaping tablespoon of yogurt on the bottom, then a layer of berries, then split the remaining yogurt, and sprinkled the remaining pepitas and berries on top.